In the competitive real estate sector, Godrej Group has been evolved as a rising star, which is growing every year by launching modernistic residential projects for home seekers. By taking the same trend ahead, the giant has again proposed a new project named Godrej Evoke Villas that is sited at sector-27, Greater Noida. Being an under construction project, if offers outstanding range of studio apartments and villas in 1RK, 2BHK, 3BHK, 4BHK, and 5BHK ranges. All types of properties have been planned precisely to build by the company and their possession will be available in Feb 2022. The project has a good master plan that includes 3 floors plan and multiple towers as well. Besides, the project is sprawl over huge area up to 100 acres and has open space around 80% that allows one to live life fullest and stay close to nature around the corner. The company has planned to develop more than 200 units in the project and has estimated their price list between 45.82 Lakhs to 3.08 Crores. Also, the giant may resale the property at affordable price range of 41 Lakhs to 23.5 Crores. Hence, the home seekers can compare the prices of their desired range of property and can book multiple units in advance. Apart from that, the project plan includes spacious apartments and villas, which will be made earthquake resistant and versed with finest housing facilities such as stunning kitchen, bathroom, hall, bedroom, lawn, windows, doors, etc. One will find all these comforts in every villa and apartment in the project. The company has gifted some more fascinating amenities in Godrej Evoke Villas such as fire fighting system, gym, club house, parking, garden, kids play ground, jogging track, swimming pool, water supply, power backup, tennis court, and many more. 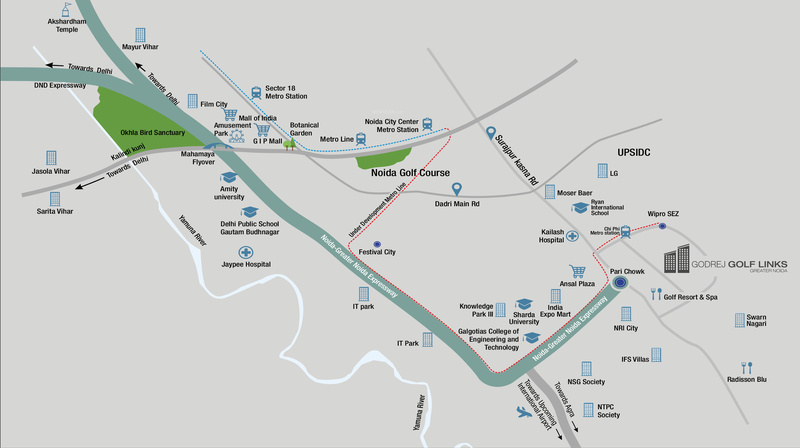 Furthermore, the project site is close to bus stand, hospital, school, college, shopping mall, metro station, etc. Hence, it will be an intelligent deal to book apartment in this project and become owner of a magnificent property in Greater Noida. The Godrej Evoke Villas project also gives easy accessibility via Yamuna Expressway (5 mintues), Gautam Buddha University (2.5 km), NH-24, and other parts of Greater Noida. Besides, the project location is easy to approach through roads connected with Noida sector-18, Delhi, Ghaziabad, etc. Thus, the families will be happy to stay connected with residential and corporate areas for living and business requirements. So, do not waste the time and be a smart customer by booking your unit in advance. Sector 27 Greater Noida 970 - 1260 Sq.ft. Sector 27 Greater Noida 710 - 1450 Sq.ft. Sector 27 Greater Noida - Sq.ft.